There are times when you just want to sit back, have a good time, and let the world wash away. The No. 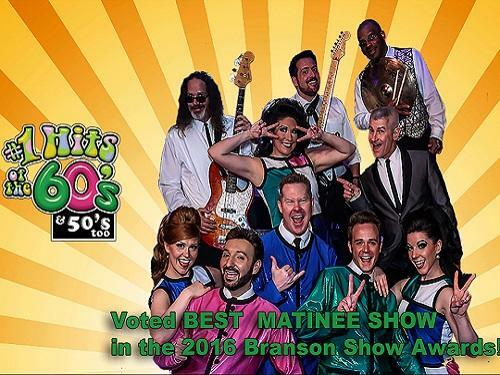 1 Hits of the 60’s (and some 50’s) is the perfect production in Branson for just that. The show pumps out bits of over 100 tunes that take you back to cruising and cranking that AM radio with your best friends. As the memories come rushing back, the energy of the production will have you dancing in your seat. It’s not uncommon that the seats can’t hold the guests and they start dancing down the aisles! If jumping up isn’t your thing, then keep your eyes and ears wide and be engrossed in the performance itself. With a cast that performs as if it is playtime, the stage pumps full of energy as these broad-smiling performers give an aerobic dance workout and burn through over a hundred costume changes while singing all those great hits from the British Invasion and Motown to the Age of Aquarius, surfing, and more. Make no mistake, this music isn’t just for those of that era; even teenagers know good music when they hear it and a good performance when they see it. So, if you’re bringing family, do something YOU want to do and hit the No. 1 Hits of the 60’s and some 50’s. The pace and performance will please your clan. Best of all, you get the music YOU want! As always, Branson Ticket Deals has a nice discount and great seats! You know you will see them one day, so you better do it this season! The Incredible Acrobats of China featuring the Shang Hai Circus has comprised even more of the most impressive acts from the ancient Orient. With an enticing blend of physical feats and artistic beauty, you will be in awe and wonder. At times you might wonder, “Why in the world would someone even try that?” Thankfully they did and do for a presentation of art merging with athleticism in a full production. If you are overwhelmed with the number of show options or can’t agree with the rest of your party on a genre of music, this production is the perfect match that will impress even the grumpiest of travel partners. Before the show, they conduct the Chinese Tea Ceremony for you, their honored guests, and you can sample the mystical nectar of centuries old. Branson Ticket Deals has an automatic upgrade to the VIP seats AND at a HUGE savings! With a mesmerizing show, tea ceremony, and VIP seats; this is the season to see it! After Labor Day, the demographic of Branson does a quick switch from families to a more experienced clientele that are usually more interested in shows than attractions. 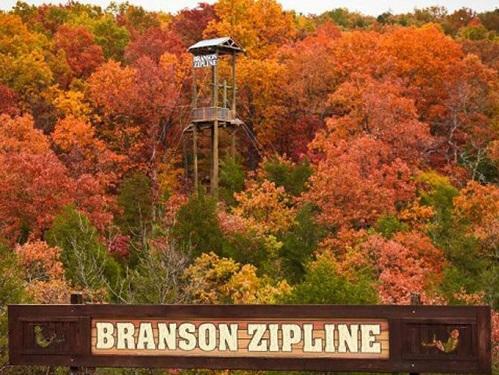 The Branson Zipline isn’t a show but these Ozark Hills are nature’s way of showing off and a zip through the trees is a fantastic way to experience these mountains and what else our small town has to offer. I know you’re thinking that you aren’t willing to risk body parts to prove to some punk that you still got it, but this is the way to go for fun for you! Highly trained and incredibly safety conscious, the personnel at Branson Zipline and Canopy Tours know their stuff and how to take care of guests. Unlike some zips, there aren’t massive steps or hard hiking or use of a brake to stop yourself. If you can walk, take a handful of steps, and like a little invigoration; you are set. Several different zip tours are offered from 4 to 7-line zips for an exhilarating flight through tree tops to blow through what’s left of hair or the exciting Blue Streak and Free Fall for those with a strong pacemaker. The fall in the Ozarks is beautiful, the temperature pristine and the colors enlightening. Do this for you! You will love this unique experience in the beautiful Ozarks!